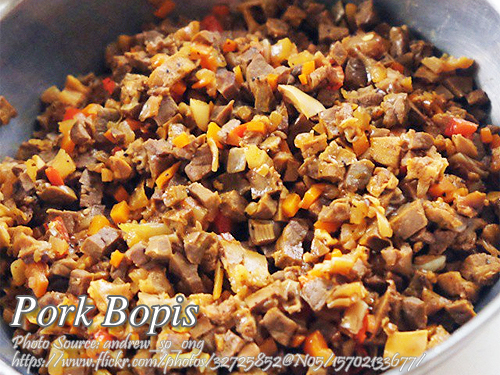 Bopis is a popular Filipino spicy dish made with pig’s innards like heart and lungs. It is great to serve as an appetizer or main dish, as a mouth watering viand served with cooked rice. The process of cooking this dish is simple but don’t forget to wash and boil the pig’s lungs in water and vinegar since there is a strong odor and offal taste if you will not include vinegar. Some use lemongrass but I think vinegar is the best for removing or minimizing the odor. Depending on your preference, you can cook this bopis dry or with a little sauce. Personally prefer the dry bopis because it masks the pungent odor of the lungs and sometimes I can taste it a little slimy when it has sauce. Wash the pork heat and pork lungs thoroughly in running water. In a large pot, put the pork heart and lungs and pour water just enough to cover the pork innards. Add a cup of vinegar and one tablespoon salt. Bring to a boil and cook for 25 minutes or until tender. Remove from the broth and drain. Cool and dice finely or chop into small cubes. Set aside. Heat oil in a medium size wok or cooking pan, saute garlic and onion until fragrant. Add in the pork heart and lungs and saute for about 3 minutes. Season with chili powder and laurel leaves. Add in the carrot, radish, bell peppers and stir. Pour one cup of vinegar and soup stock then bring to a boil. Cook until the liquid evaporates and almost dry. But you can leave some liquid if you prefer the bopis with sauce. Pour the annato water and season with patis and black pepper. Stir and simmer for a minute more then turn off heat. Serve hot with cooked rice and enjoy!